Baconfat Log: Pulp Alley Action! Vinter Vunderland adVenture! or The Phantom Menace's Winter Vacation. Pulp Alley Action! Vinter Vunderland adVenture! or The Phantom Menace's Winter Vacation. I must apologize for a long absence and my not wasting valuable internet space with mindless posts. 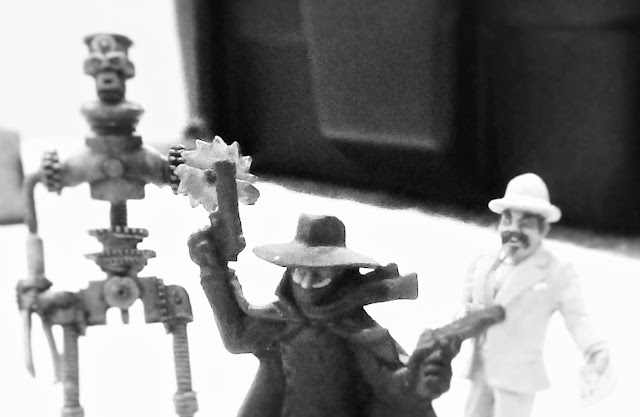 First we'll another Pulp Alley adventure, run by Lord Dain (Dave), starring everyone's favorite Phantom Menace, then I'll post another post with some recently painted minis. Here are the villians of the film: Peaches, Munter, Gunter, Bosun, Capt Wolf, and Fifi. The infamous fame of these villians has brought them an ally, the Creepy Old Man. Luckily, the Phantom Menace has recruited more members for his gang, er, team. The Maniacal Mechanical and Charevil Chan. Here's the entire gang, I mean team of heroic heroes. Slick, Maniacal Mechanical, Phantom Menace, Charlevil Chan, Mr. Hooks, Dr. Naughty, McDonald, and Harvey Rabbit; is that box in the background a clue to future projects??? Here is the romantic winter scene where the action will occur. The four red markers mark the minor plot points and the ice fountain sculpture in the middle marks the main objective. As expected the teams deploy on opposite sides and immediately run toward nearest minor objectives. Slick and Charlie head to a minor plot pointand solve it. McDonald and Dr. Naughty find our second objective. The nefarious Captain Wolf and Fifi have eyes on an objective of their own. Bwah-ha-ha, the Phantom Menace shoots and wounds the moronic Gunter, but where is that witch Bosun? The villainess is hiding behind a tree and attempting to solve a plot point. Nearby the cleaver wielding creepy old man pops out from a tree! Luckily the eagle eyed Mr. Hooks and Harvey Rabbit are ready to knock him back. McDonald remembers to breath while Dr. Naughty solves our second plot point. "No, no, no McDonald you may not take a BM in the chair. I told you to go before we left the lair"
Captain Wolf solves the first bad guy plot point and is joined by the rabid mongrel mutt Peaches and the big gun toting Munter. Bosun is about to solve the plot point, but she fails. The ga... team rushes the center of the table and is ready to grab the main objective, on the off chance the bad guy B-squad can ever finish their second plot and open this one up. That dammned beast Fifi has been unleashed by Captain Wolf. His tiny brain has focused his attention on our valiant robot, Maniacal Mechanical. Drat, the mindless Gunter has arisen from his short nap. You can see, almost everyone has made it to the center. Chaos will surely ensue. The Maniacal Mechanical's chest cavity opens and barfs a hot steamy blast onto Fifi. The blast nearly misses Bosun, who has given up her attempts on Capt. Wolf's second plot point to help out in the middle. Luckily Mr. Hooks shoots her down with his hook friendly pistol. Captain Wolf has made it to the fountain (at the top of it). You'll notice Peaches is attacking Harvey Rabbit. The two of them spent most of them playing together. Mechanical moves around the fountain to blast Wolf, but the villain escapes unharmed. Wolf swings around the fountain and rudely assaults our good Doctor. When no one is paying attention, Capt Wolf's Gunter (off screen) has uncovered their second plot point. This has enabled the Phatom Menace to uncover the MAIN OBJECTIVE!!!! BWAH-HA-HA-HA! The party pooper Munter has just arrived to shoot his big dumb gun and knock down poor Maniacal Mechanical. Vengeful, the entire team unloads their firepower at Captain Wolf. He goes down, several ounces of lead heavier. The Mechanical mechanically returns to his mechanical feet. The team sees the opportunity to leave with the prize. "Return to the Phantom Lair, hot chocolate and cookies for everyone!" Manical Mechanical farts his greasy hot gas blast onto Munter. "TASTE THE HOT FROSTING OF OUR HOT VICTORY FLAVORED CUPCAKES OF WINNING! ", says the robot with his voice modulation unit, apparently damaged by Munter's earlier gunfire. The team sneaks away like thieves in the night, I mean they heroically march off the field. Harvey is still battling (playing with) Peaches. With most of Captain Wolf's gang consisting of snow angels and the Phantom gang in supreme ascendancy, we call it a game. "BWAH-HA-HA-HA-HA!!!!!! We must stop at a convenience store and buy zee miniature marshed mellows and zee sprinkles for our hot chocolates. Nothing but zee best for our gang, er, I mean team." Till next time, when we have painted Dacians and Dwarves and maybe a poop monster. Great stuff! I'm finally about to have my first go at Pulp Alley...really looking forward to it! Barking mad and great fun. Nice painting, and what looks to be a ton-of-fun. What a great game, with fun had by all. Really like Mr Chan.